A group of street cleaning employees are in the canteen chatting amongst each other. One tells a joke about a plot to assassinate the pope. Another colleague half hears the joke thinking it’s a conversation. They report the incident to the police. What happened next was symptomatic of the USA McCarthy era, when you could be detained, and denounced as a enemy of the State if you had or were suspected to have any political leaning towards communism. The difference today is that if you’re a Muslim there’s often an automatic suspicion that you could be a terrorist. A heavy handed metropolitan police force arrested the workers under the Terrorism act. It seems then the police informed the media that they had arrested a group of Muslims on suspicion of plotting to kill the Pope. Why details of the individuals and the alleged target were leaked to the press, particularly whilst investigations were still ongoing is a cause for great concern? Equally worrying were the headlines that screamed out across the broadsheets, tabloids and TV bulletins, without much caution as to the validity of the story. 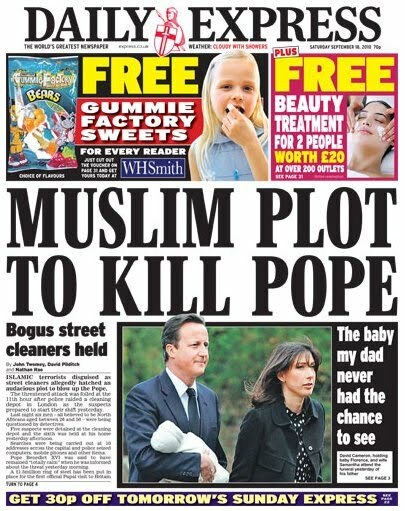 The worst offender was the Daily Express, who with five words not only condemned the workers, but also Muslim people around the world with the gratuitous headline, ‘Muslims plot to kill pope’. With almost zero information the paper went on to accuse the workers of being ‘Islamic terrorists’, who, ‘disguised as street cleaners allegedly hatched an audacious plot to kill the Pope’. Some 48hrs after their arrest all the workers were released without charge. It had been a mistake. And yet who knows what untold damage has been done both to the workers and the way we see Muslims in this country. It is time to call time on a heavy handed Metropolitan police force and an out-of -control media, particularly those sections which are hell bent on stirring racial and religious hatred.